“Space Dance in the Tube” is an exhibition, a workshop, and a performance with a new communication based on the whole body to get an awareness about the familiar relationship between the body and the space.. Now we have 6 spaces for this project using by 6 tubes, “Space for Balance”, “Space for Darkness”, “Space for Light”, “Space for Play Tag”, “Space for Posture”, and “Space for Real & Virtual.” We think that this project is very useful for scientific education, communication, experience of art & science, new experience of rehabilitation, developing a health. At a NASA sponsored conference on Human Systems I reminded the audience of the impact that a photo of the earthrise over a moonscape had on the perception of our planetary condition. The making of this image marked an important moment in the history of human experience. I suggested that a similar event may mark the first voyage to Mars when the blue planet fades into the background of stars before the red one becomes prominent. The sense of profound isolation may not be pleasant but should make for an interesting moment of reflection. One similar to, but I expect orders of magnitude greater than, when mariners first ventured out of sight of land. These experiences have value to our culture in that they shape our understanding of ourselves. Much of what can be learned about extreme environments will be in the form of data, measurements that we can compare to others that we have made in order to shape an understanding of the new in relation to the known. Some have suggested that extreme environments such as those found in extraterrestrial, undersea or polar environments require interrogation by robotic and remote sensing techniques rather than by human exploration and habitation. While these techniques are capable of providing representations that can be understood intellectually, they are incapable of providing a direct experience. Others argue that human beings are the most robust and versatile autonomous control systems available and must be included on missions for that reason. But beyond functionality and instrumentality, arguments that will be continuously eroded by technological innovation in any case, I argue for the irreplaceability of human presence in extreme environments on the grounds of human experience. However, there is a contradiction here. Extreme environments, as noted by Louis Bec (2007) , do not exist a priori but depend upon the relationship between an environment and the organism in question. We count those as extreme that are hostile to life and are able to venture into them only by virtue of our technological interventions. We participate to the extent that we can remain within a protective technological bubble. These technologies reduce or eliminate the experience of the extreme conditions even as they protect the organism from it. But, can technologies be developed to open extreme environments to experience rather than shielding us from them? I believe that prototype devices have already been developed that show how this can be accomplished. Perceptual prostheses of the kind described here will enable the direct perception of hostile conditions from with in the technological womb. While humans are physiologically capable of experiencing many salient features of their terrestrial environment, this may not be the case for extreme and alien environments. These environments may require the immediate awareness of other spectra or conditions by means of technologically mediated perception. Prosthetic perception may become a key enabling technology for the habitation of extreme conditions in addition to providing the principle justification for a human presence in them. This paper considers the work of artists, designers, and activists who, since the 1990s, have worked with body covering as survival mechanism and social tool. Individually or within collectives, they call their work art, design, or activism; or all three. The result is a “body of records” of technological, biological, and performable wearables that have not received the attention they deserve, both as art and design, and as vehicles for ideas about threats to species survival and collective experience. 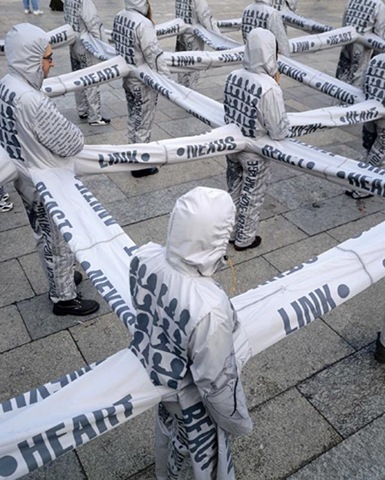 For example, in the early 1990s artists created wearable artworks in the form of survival attire embedded in localized performative events concerned with social connection under adverse circumstances. Lucy Orta is prominent among such practitioners, who formulate clothing the body as critical, social, and ethical practice within an ambient “culture of fear.” (Fig. 1). Fig. 1) Lucy Orta, Nexus Architecture x 50: Intervention Köln 2001. This paper is intended to introduce the system, which combines “BodySuit” and “RoboticMusic,” as well as its possibilities and its uses in an artistic application. “BodySuit” refers to a gesture controller in a Data Suit type. “RoboticMusic” refers to percussion robots, which are applied to a humanoid robot type. In this paper, I will discuss their aesthetics and the concept, as well as the idea of the “Extended Body”. The system, which I introduce in this paper contains both a gesture controller and automated mechanical instruments at the same time. In this system, the Data Suit, “BodySuit” controls the Percussion Robots, “RoboticMusic” in real time. “BodySuit” doesn’t contain a hand-held controller. A performer, for example a dancer wears a suit. Gestures are transformed into electronic signals by sensors. “RoboticMusic” contains 5 robots that play different sorts of percussion instruments. The movement of the robots is based upon the gestures of the percussionist. Working together with “BodySuit” and “RoboticMusic,” the idea behind the system is that a human body is augmented by electronic signals in order to be able to perform musical instruments interactively. This system was originally conceived in an art project to realize a performance/musical theater composition. This paper is intended to introduce this system as well as the possibilities from my experiences in an artistic application.